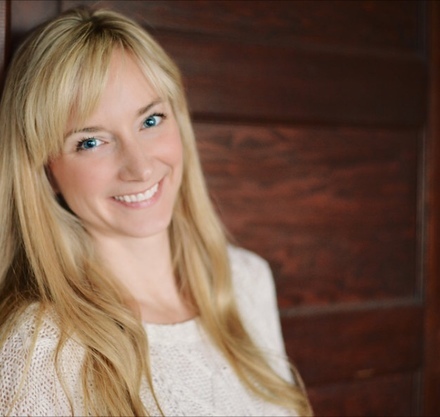 Hi, Stefanie here and I am so thrilled to share our new guest contributor, Julianna ! She is passionate about living a life full of purpose and intention while sharing ways to SIMPLIFY life! 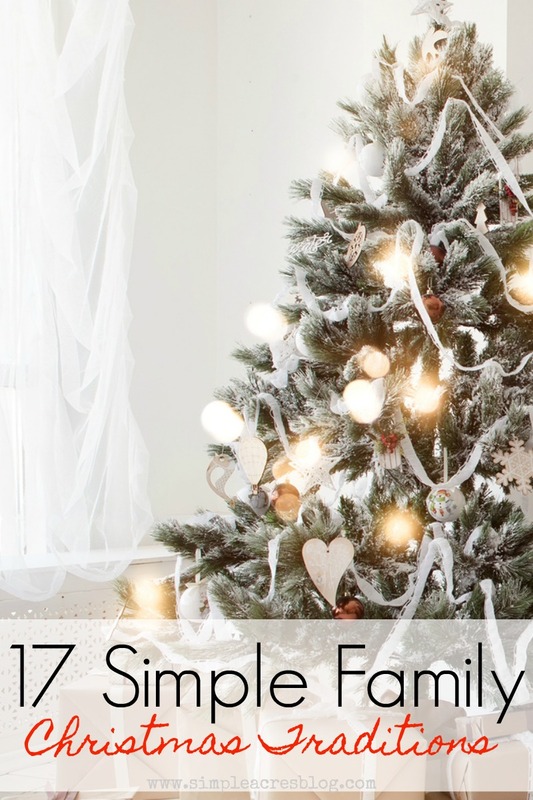 Today her article is ALL about how to simplify the holidays with her 17 simple family Christmas traditions that are sure to fill your family with joy this season! Do you ever feel like you don’t have holiday traditions but you wish you did? Or maybe you have some, but they take too much money or time. 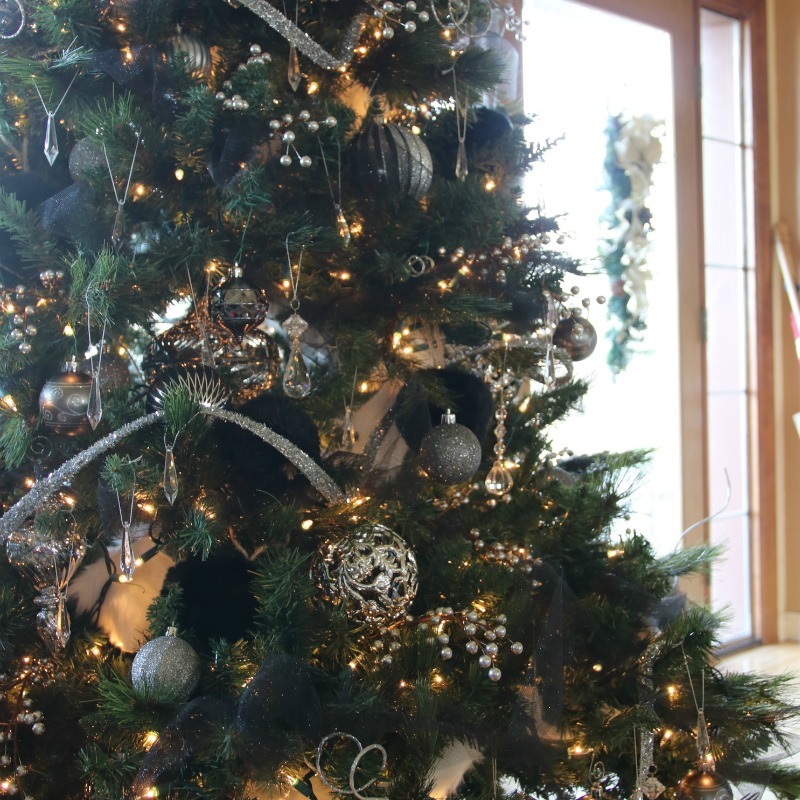 Either way, I wanted to share some great simple and inexpensive Christmas traditions that I love. As a warning, it can be easy to get excited about the idea of adding new traditions. Don’t try to do them all in a year. Pick what works for you and your family. If your goal is to have a simpler holiday season this year then be very thoughtful about what you add to your schedule. 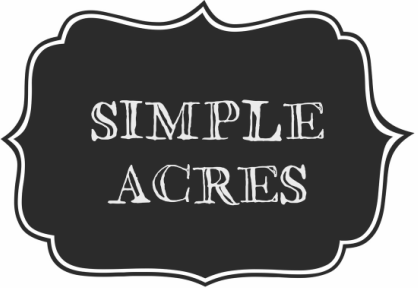 I wrote a long post over on my site about simplifying the holidays HERE. Who says gratitude practices should end with November? It is so easy to switch from being thankful to focusing on wish lists. To combat the self-focus, continue traditions that practice thankfulness through December. 1. Every day write something you are thankful for on a piece of paper and put it in a jar. On December 31st, read all of the things you and your family members have been grateful for that year. 2. At a family meal, go around the table and let each person share something they are thankful for about the person to the right of them. This is a great way to lift each other up and practice gratitude for our family members. 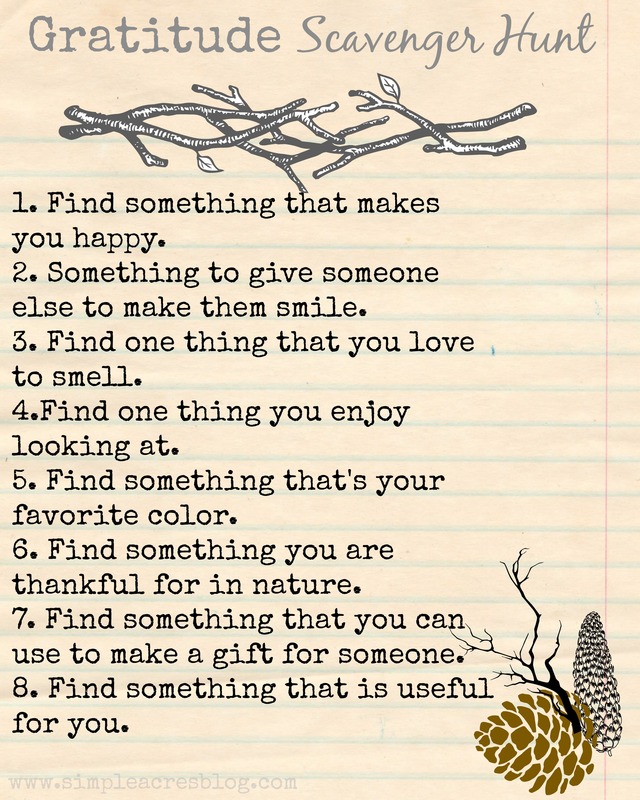 You may enjoy doing this gratitude scavenger hunt if weather permits! There are many ways you can choose to approach gift giving. I talk about that more in my post on simplifying the holidays. These are some ideas if you are looking for ways to change up your gift giving traditions. It’s a good idea to have open conversations with family members to try and get everyone on the same page. 3. Limit gifts to 4 per kid and get something to wear, something to read, something they want and something they need. There is a gift worksheet in my free Simplifying the Holidays Planner which you can sign up for HERE. 4. Hide gifts. This is one of my favorite traditions from my childhood. After we were in our rooms for the night on Christmas Eve, my dad would take our presents from under the tree and hide them around the house. We’d wake up before the sun and take out our flashlights and search for them. Our 1 rule was we couldn’t get our parents up before 7 (which is funny because my mom has never ever slept in til 7 😉). My kids now love this tradition. Pro tip: count how many gifts there are before you’ve hidden them. We may have misplaced a couple once. 5. Do a gift exchange. Feeling overwhelmed with having to buy gifts for all of the adults in your family? See if you can get everyone on board to do a gift exchange. Limit the cost so that people are staying within the same range. The bonus is the exchange part is a fun activity to do on Christmas. Another option is trading names so each person is still only buying for 1. This saves time, money, and stress and helps you not end up with a ton of extra stuff. 6. Experiences instead of gifts. You can give experiences in place of gifts, such as passes to a local museum, an activity, lessons, etc. Another option is to opt out of gifts altogether and instead enjoy an experience. Enjoy a winter vacation as a family instead of buying gifts. 7. Make cookies or treats for your neighbors and deliver them. My mom used to make a dozen different kinds of cookies each year for this! It was very impressive, but the thought of that exhausts me. I made peppermint Chex mix for the neighbors last year because you can do it in big batches and I just don’t love baking that much 😉 Neighbors love getting the treats and it is fun to have someone who isn’t selling something come to your door. 8. Pick a local family or organization to support by buying gifts for them. Organizations you can check out are Operation Christmas Child, Giving Tree, Rescue Mission, and your local food bank. You can find other organizations HERE. Sharing with others is a great way to help make someone else’s Christmas better and is a good reminder to children to look for ways to bless others. There are so many options for activities during the month of December. It’s important to know what your priorities are for the holiday season and then makes your plans accordingly. I’ve found it helpful to think through my own goals, then discuss them with my husband and then share our plan with our kids. In the free Simplifying the Holidays Planner, there is a page for prioritizing to start that discussion. It also includes calendars for November and December for planning out activities (and hopefully not overscheduling 😉 ). 9. Have a PJ day and spend all day in your pajamas. This allows for a fun relaxed day at home where you can play games, do puzzles, watch Christmas movies, and maybe even bake some cookies (if that’s your thing). 10. Baking-make sugar cookies and decorate them (if you have little kids try decorating the cookies outside if weather permits or just expect that it will get really messy😉). I’ve found that expectations are important and if I know it will be messy I can handle it a bit better. 11. 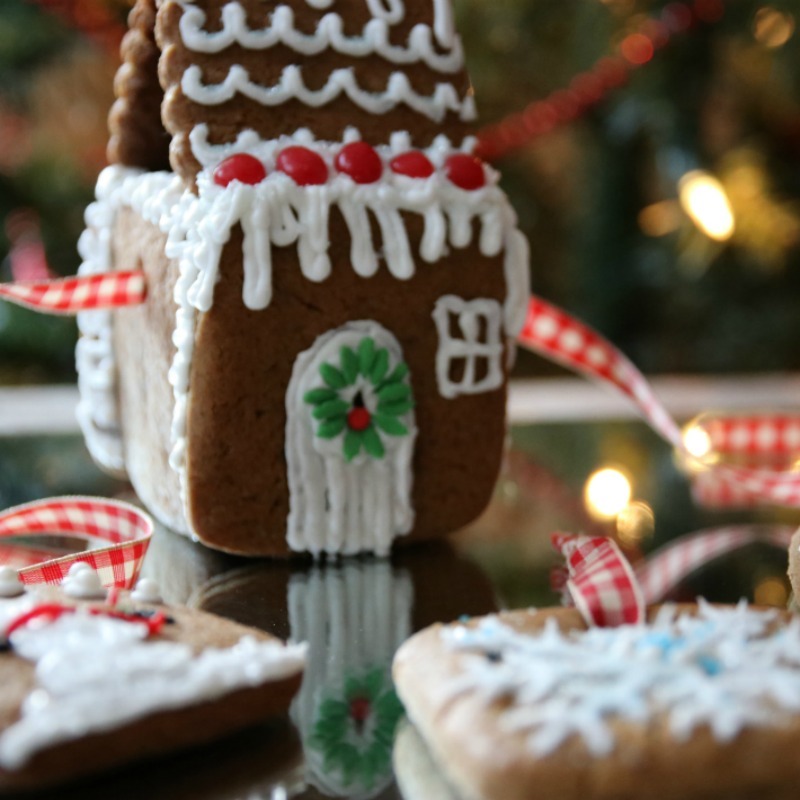 Make graham cracker houses. Kids LOVE this activity because it is full of sugar and candy. It is another messy one but it is fun to see how each child approaches decorating their house. 12. Look at local lights. Find out which neighborhoods in your area have great Christmas displays and go see them. We have one near us where the lights move along to music on a radio station. We bring a treat in the car with us and enjoy it while watching the lights ‘dance’. 13. Snow play. If you live in a place that gets a lot of snow, this one may be less novel for you. We tend to only get a few light dustings here, so planning a day where we drive about an hour or two to the snow is great fun. We typically borrow snow gear and sleds from friends to keep the cost down. Pro-tip: parents, don’t forget to make sure you are well covered with your own jacket, hat, snow pants, gloves, boots, etc. It is easy for us to become so focused on having all the things for the kids that we forget something for ourselves. 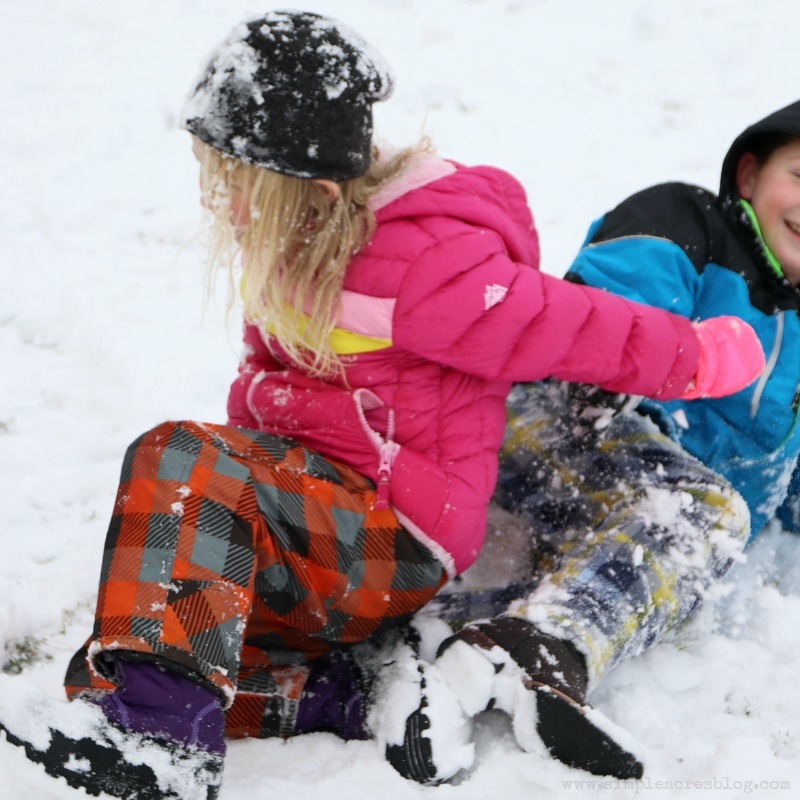 This may or may not have happened to my sister last year and let’s just say it is not as fun to play in the snow with your kids when you have forgotten your own coat. 14. Non-traditional Christmas eve food. About six years ago I started making homemade lasagna for Christmas Eve dinner. I’ve continued making the Italian meal each year and we’ve enjoyed having something a bit different from the fancier foods. I have friends who get Chinese take out each year on Christmas Eve. You can do whatever works for you, but thinking outside of the norm can be a fun new tradition that makes things easier than another fancy meal that takes a lot of preparation. It’s so easy for the Christmas season to become focused on ourselves. Our consumer culture has made so many things about us. For our family, we value our faith so it is important for us to communicate that the meaning of Christmas is the birth of Jesus. We choose a few activities to help keep the focus on Christ. 15. See a living nativity. We have been to two different local living nativities. They were both good experiences. One required buying tickets in advance and they sell out early. The other was more casual and you show up when you want during the scheduled time that weekend. In both situations, waiting was required and it was outdoors and cold. We knew after the first year to plan accordingly. If you are looking for something like this in your area, I recommend doing some research in advance. 16. Read Christmas story. When I was a child, my dad read us the Christmas story out of the bible on Christmas Eve each year. We are passing along the tradition along to our children as well. 17. Christmas Eve service. We love going to the candlelight service at our church on Christmas Eve each year. Our extended family comes with us and then we all enjoy dinner together afterward. The kids especially love the glowsticks they get to light up and singing Christmas carols together. After dinner, the kids get to open one gift (which is usually matching pajamas for all of them). Choose only the traditions that will resonate with you and work for your family. In the end, your traditions should reflect your values and your priorities for the holiday season. To help you in getting to your goals, you can get the free Simplifying the Holidays Planner HERE. I hope you enjoy the coming season and that you experience some simple traditions with your family.